By default, Chrome (which is built and maintained by Google) automatically offers to translate web pages not in your Chrome language. Since I have Chrome set to English, visiting a page written in French or Spanish shows the popup. If you speak a particular language besides English, you don't want to see that popup for that particular language. 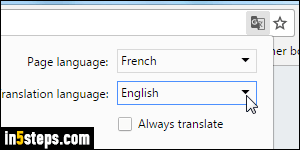 Chrome lets you hide the translate popup for specific languages, or turn off Google Translate altogether! I don't want pages written in French to be translated. 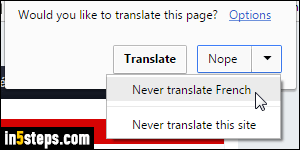 So, when the "Would you like to translate this page" popup appears, I just tell Chrome that I don't need the Google Translate service by clicking on the dropdown arrow in the Nope button, and by choosing "Never translate [language name]". But also notice that Chrome lets you exclude specific websites, without affecting your language settings: choose "Never translate this site" to add a site exception! 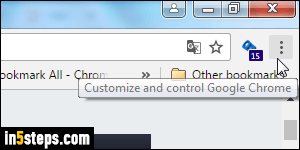 To disable all Chrome translation services, click on the menu button (three bars or dots, in the top right corner of the window), and choose "Settings". To go faster, type "language" in the search box at the top: it hide options unrelated to your language settings. To completely turn off translation, for all languages, uncheck the Offer to translate pages that aren't in a language you read checkbox. In that case, you are done! Close the Settings tab. Bonus Tip - Translate from any language into any other language! If you click on the Options link in the Translate popup, you can manually pick the Page language (in case Chrome didn't recognize it), but most importantly, you can pick the translated-into language! 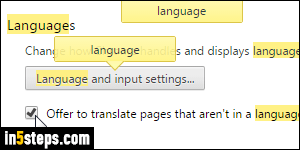 If you check the Always translate checkbox, Chrome will automatically translate pages in that language!